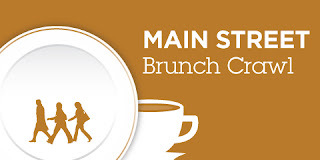 Here we are, the last Brunch Crawl for the Dine Out Vancouver Festival. I made it! Yes, poor me... Anyways, liquid sunshine greeted us for the crawl along Main Street, but I brought alone my golf umbrella, so all was good. Well, not until I tried to squeeze in between poles... So this time around, Emily joined me since no one would be crazy enough to do all 6... er... We also met up with Joyce (who was smart enough to not do all 6). The registration point was at The Honey Shoppe, but we decided to come back at the end since they were serving something sweet. So we hopped in my car and drove all-the-way down to Rosemary Rocksalt. Since I went to the North Van crawl, the basket we were served looked familiar. 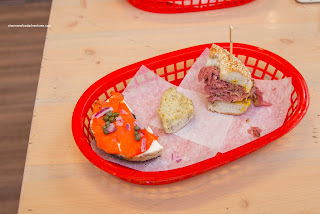 It included Lox & Cream Cheese, Vegan Cashew Spread and Montreal Smoked Meat on a sesame bagel. As much as I enjoyed the smoked meat sammie and the lox, I found the cashew spread intriguing with its creamy nuttiness. After, we walked over to Nirvana. 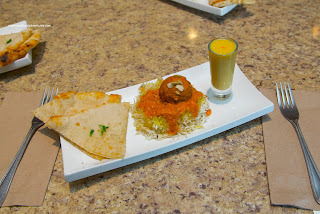 There, we were served a plate consisting of Mozza Naan, Malai Kofta on rice and a Mango Lassi. I wasn't a huge fan of the naan as it was rather flat and lacked charring. However, I did enjoy the kofta as it was soft while maintaining some texture. The flavours were slightly mild but I could definitely taste the cumin, coriander and cashews. 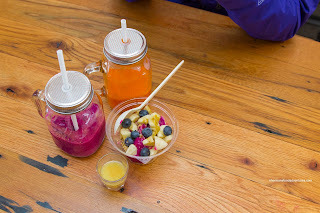 From there, we headed over to Radicle Juice and probably the highlight of the crawl. After a 1 oz. Heat Shot of ginger apple and lemon, I dug into the Pitaya Bowl blended with banana and coconut water topped with granola and blueberries. On the side, I went for something similar in the Dragonfly made with fresh OJ, coconut milk, strawberry, pineapple, dragonfruit and ginger. Normally dragonfuit does not have much in the way of impactful flavours. But when blended with the rest of the ingredients, there was a muted sweetness to go with a whole lot of brightness. 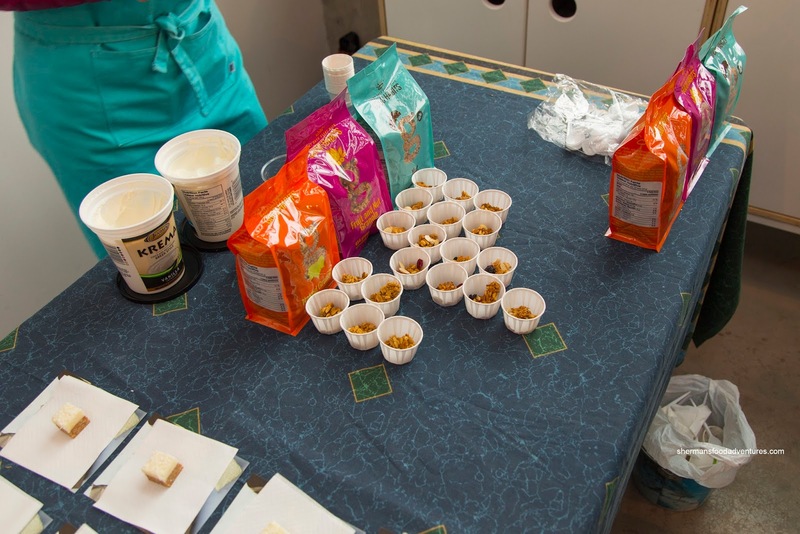 Over at The August Market, we were able to sample some Granola by Good Habit Foods. To be frank, the portion size was far to small for us to get any beat on the product. It was light sweet and crunchy from the bits I did get. Right next it was the good ol' Lemon Square which was good as always. We ended things off where we began at The Honey Shoppe. 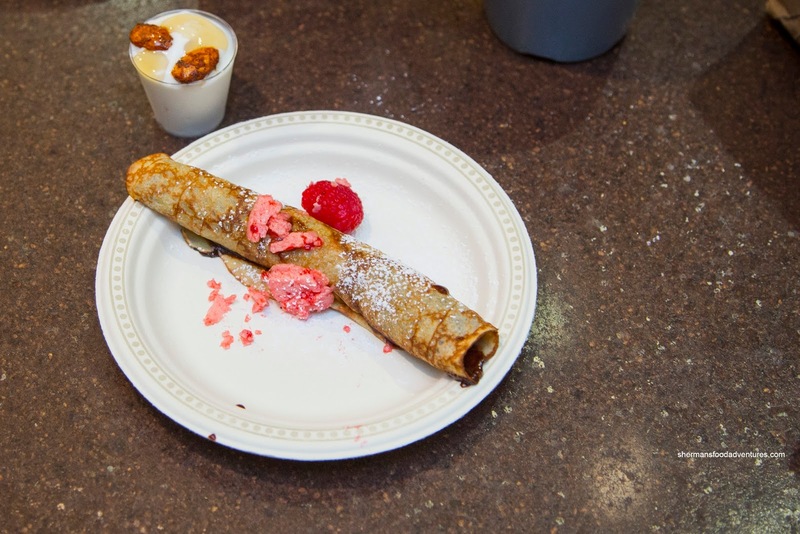 We were served Warm Chocolate Almond Crepes with raspberry honey butter along with Spiced Honey Glazed Almonds with frozen yogurt. As much as the crepe was thin and fluffy, the filling was super sweet. It was hard to finish due to that fact. On the other hand, the plain frozen yogurt was a nice counterbalance to the drizzle of honey and sweet almonds. Thank goodness we didn't start with this as these 2 items were more of a dessert than brunch items. Overall, this crawl was okay, but a little lacking with the granola. - What was the point about the granola, if the serving size was that small?